Please call the Candler Art Gallery @ 1-888-672-8401 Ahead to ensure availability of Audrey's work - Some paintings displayed on this site will be in other galleries in Alberta, British Columbia, or Saskatchewan. Where we live, as we grow, we take in the energy of that area and it becomes a part of who we are. We cannot escape it, but we can view it from many perspectives, each impacting its own emotions; creating its own memories; taking us into our own direction. Having grown up in the country, I have a close affinity with the land. I have to embrace and become each area of the landscape in order to interpret that sense in a way others may feel my intensity. I paint to convey my emotions and feelings - expressions of everything around me. Inspired by Turner, Constable, Van Gogh and the Group of Seven, I desire to continually push colour to interpret the strength and diversity of this land. Regardless of the season, I am inspired by the fleeting beauty and eternal power of nature. My choice of mediums are pastel and oils, although I have also worked in watercolours and acrylics. Please email the gallery to view more works by Audrey Pfannmuller. 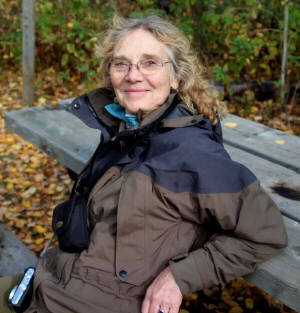 Audrey Pfannmuller was raised in a small rural community in north western Alberta. Art and design have always been an important means of expression for her. She began her formal training at Olds Collage with a fashion certificate which was followed with a couturier degree under Sig Plach of Edmonton. She then went on to study art at the Extension Branch of the U of A under the following instructors: Douglas Barry, Harry Savage, Harry Wolthfarth, Ihor Dymtryk, and a selection of potters and sculptors. Other instructors in later years have been Alfred Schmidt, Ruth Whitney-Gerwin, Brent Laycock and Neil Patterson. Audrey Moved to Camrose in 1975 where she opened the Candler Art Gallery. At the Gallery, where she is in constant contact with people, she is able to share her concepts on the enjoyment of visual arts. Working in pastels and oils, Audrey shows her love of people by choosing to paint them and their environment. 2002-00 Adele-Campbell Gallery, Whistler, B.C. 2000 Jenkin's Gallery, White Rock, B.C. 1999 Pastel Society of Canada, Hull, Que.